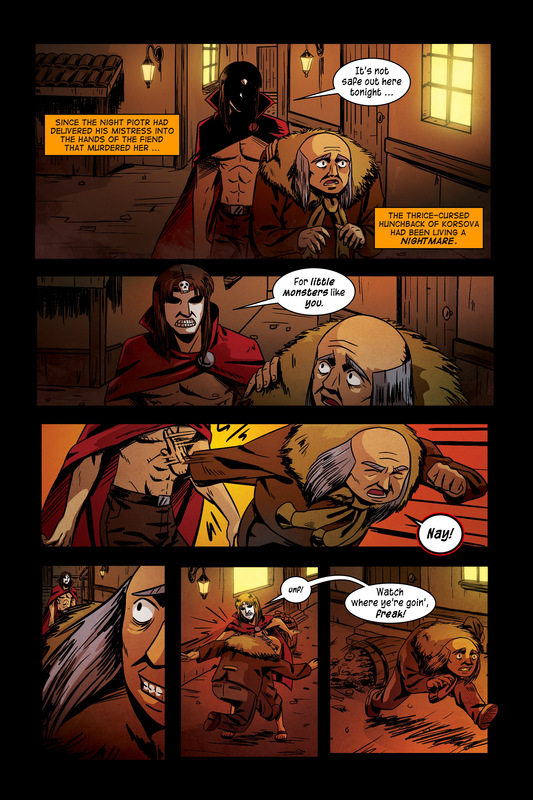 The last time we saw the hunchback Piotr was alllll the way back in Chapter 1, Page 4! Since then, things haven’t gone well for them. His mistress, Mischaelna, was murdered by her father Vanion. This chapter, we’re going to get to know Piotr a lot better, kicking his entrance off with this nightmarish scene. Enjoy! 🙂 And let me know your thoughts down below in the comments’ section … I love hearing from readers! I’ve a lot of fun building the world by going off to the side and exploring characters like Piotr. I’ve been looking forward to this chapter, and spending some more time with Piotr, since that very first page! 🙂 I’m glad you’re along for the ride, man. It’s gonna be a grim one. Poor Piotr!! He makes me so sad. ? You always gotta root for the gentle-hearted hunchback, right?